Edmund Tudor, son of Catherine of Valois, the French widow of Henry V and Owen Tudor, her Welsh clerk of the Wardrobe was born either at Much Hadham Palace in Hertfordshire or at Hadham in Bedfordshire. It is not known with certainty whether he was born legitimately after his parents were secretly married. The name Edmund is believed to have been chosen for Edmund Beaufort, Duke of Somerset, whom recent unproven theories suggest was actually his father, but a more likely explanation is that Beaufort stood as his godfather at his christening, it was a common practice at the time to name a child after a godparent. By all accounts Owen Tudor, a descendant of Anglesey landowners, was a handsome young man, the chroniclers dwell upon his beauty, at some point he became the Dowager Queen's lover. Legend relates that Owen caught the Queen's eye when she saw him swimming, or that he tripped and fell into her lap when dancing. The affair is thought to have started at Leeds Castle in Kent. No documentation has survived of Catherine's marriage to Owen Tudor in 1429. The discovery of at least three of the queen's illegitimate children had caused scandal at the time, and was seen as an insult to the memory of the great Henry V. Owen and Catherine produced at least five children in all. Edmund, Jasper and Owen Tudor were all born away from court. They also had two daughters, Tacinda, who married Reginald Grey, 7th Baron Grey de Wilton and Margaret who later became a nun. In 1436, when Catherine was pregnant with her fifth child by Tudor, rumours of the Queen's secret marriage reached the ear of Humphrey, Duke of Gloucester. Owen Tudor was imprisoned and Catherine retired to Bermondsey Abbey, shortly after giving birth to their daughter Margaret, on 3 January 1437, distressed and traumatised at the forced separation from her husband and children, Catherine fell gravely ill. Her son Henry VI sent her a 'tablet of gold, weighing thirteen ounces on which was a crucifix set with pearls and sapphires' as a token of his love. Catherine died in disgrace on 3rd January 1437 and was buried in the Lady Chapel of Westminster Abbey. 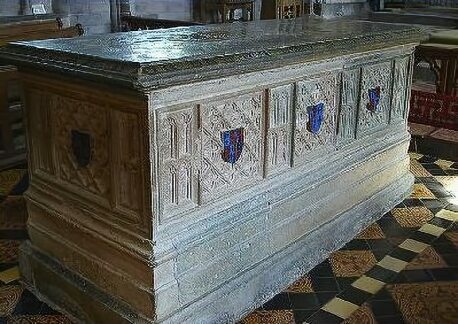 Henry VI provided an altar tomb and included an inscription describing her as his father's widow, with no reference to her second marriage. Owen Tudor lived on until 1461, on 2nd February 1461 he led the Lancastrian forces at the Battle of Mortimer's Cross for his step-son against Edward, Earl of March, the Yorkist claimant to the throne. The Lancastrian's were defeated in battle and Owen was subsequently beheaded at Hereford. He was reported not to have been convinced of his impending death until the collar was ripped off his doublet by the executioner. At this point he is alleged to have said that "the head which used to lie in Queen Catherine's lap would now lie in the executioner's basket". His head was set on the market cross, where a mad woman combed his hair and washed his face, setting lighted wax torches round about it. Edmund and and his brother Jasper went to live with Katherine de la Pole, Abbess of Barking and sister of the Duke of Suffolk. Sometime after 1442, King Henry VI, their half-brother, took on a role in their upbringing, Edmund was knighted and both the brothers were given Earldoms by Henry VI, Edmund became Earl of Richmond, while Jasper Tudor was created Earl of Pembroke. Their younger brother, Owen became a monk at Westminster Abbey. Lady Margaret Beaufort, the nine-year-old daughter of the deceased Duke of Somerset was summoned to the court of her second cousin, Henry VI in 1452, the following year Edmund was granted her wardship. The Beauforts, descendants of John of Gaunt by his mistress Katherine Swynford, had been legitimized by Richard II on their parent's marriage, but a question mark remained over their political position, but Lady Margaret was a rich enough heiress to make possession of her a profitable investment. Edmund accordingly married her on 1 November 1455 at Bletsoe Castle. Edmund was captured by the Yorkist supporter William Herbert in mid-1456, who imprisoned him at Carmarthen Castle in South Wales, he died there of the plague on 3 November 1456, leaving his thirteen year old widow pregnant with his child. He was buried at Carmarthen Grey Friars. At the dissolution of the monasteries in 1539, his remains were removed to the choir of St David's Cathedral. 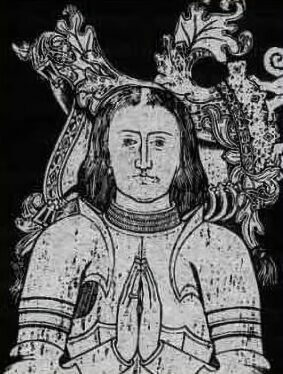 Margaret Beaufort sought protection from her brother-in-law Jasper Tudor. Edmund's posthumous child, Henry, Earl of Richmond, the future Henry VII, was born at Pembroke Castle, almost three months after his death.